We are having the second side of the Torah mantel embroidered with names in 5779. The cost per name dedication will be $30. In addition, the following dedication opportunities are available. 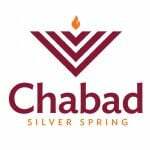 This Torah mantel is being custom made for Chabad of Silver Spring. It will include the names for every family that joins the Unity Torah project. It will serve as a beautiful reminder that the future of the Jewish people lies within our children. This item will have your dedication at the top of the mantel. Click here to join The Children's Unity Torah.